The Porsche 911 debuted in 1963 although the first cars meant for the U.S. market only reached North-American soil in early 1965. It featured a very simple line with a slanted rear end, the car being less rounded than the 356 it replaced. It still had dual headlights but, otherwise, the new design was a departure from anything 356-related and was so successful that Porsche still employs derivatives of its original design for its current 911 lineup. This particular 911, chassis #300617, was delivered in March of 1965 to the Baden-Auto dealership located in Freiburg-im-Breisgau. A certain Doctor Gouderko bought the car from that dealership and used it for at least two years before it changed hands. The car ultimately got in the hands of German artist Peter Klasen who was commissioned to cover the body of this Porsche in an evocative paint job. That’s exactly what Klasen did, finishing the livery in 2009 and signing his moving canvas just above the driver’s door. The finished product contains elements that can be traced back to older Klasen works, like a racing Porsche 962 that raced at Le Mans in 1990 and a certain Ferrari 328 GTS road car. The car also underwent a racing conversion during its 50+-year-old life. Up front, you’ll notice the black front hood which has the picture of an eye on it, in sepia colors, covered by a red-colored target. There’s also some black-and-yellow stripes across the hood and the side which are similar to the tape used by law enforcement personnel in certain situations when they have to close off a perimeter. The front bumpers are painted in baby blue, a color that fades away on the door panels to reveal the partial portrait of a woman. There is more baby blue on the rear fenders. 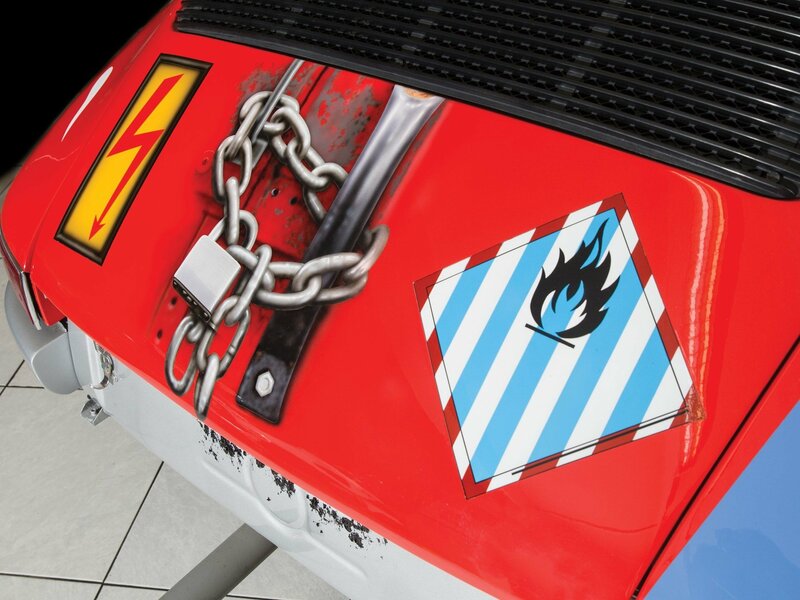 The rear quarter panel is dominated by a sea of red with a number of labels and signs scattered on the bodywork. You can see a sign on the body saying ’Alarme’ and then there’s also a sign that’s used to make people aware that they’re close to a high voltage tension box, plus a flammable sign. The car itself isn’t particularly different to any other early competition 911. Up front, the indicators are placed on the edges of the front fascia with extra air vents next to them. The headlights have a silver frame surrounding them. The silver bumper has two more openings and also a towing hook. There’s another one like it at the back. Also, some of the original body panels were replaced by identical ones made out of a lighter material. The windscreen is also lighter and, near it, there’s an exterior ignition cut-off switch. The car sits slightly lower to the ground than a normal 1965 911 thanks to competition-spec suspension and is fitted with factory-optional Fuchs light alloy wheels. These were introduced as an option for the 911 in 1966. At the back, you’ll find the usual narrow taillights around the car’s rear corners. The rear hood is held in place thanks to two pins. On the hood itself, there’s a full-size air vent with round edges. The car is fitted with a twin-pipe exhaust system. This artsy 911 comes with a bare interior, properly done so for racing purposes. There’s a roll-cage in there, racing bucket seats with harnesses and no carpeting or any other sound-deadening padding to get you away from the sound of that flat-6 behind you. The original steering wheel was ditched in favor of a racing one with an Alcantara-covered rim. Behind it there are four gauges, the tachometer being the most prominent of the lot while the odometer is placed slightly to the right. The dash lacks any other knobs or dials and even the original Webasto gas heater was removed. As such, on the middle of the dash, you only find the master switch and a small stopwatch that displays your lap times. The gear shifter sticks right out of the floor and has a chromed knob for a change. The original 911s, known as 901s, came with a 130-horsepower Type 901/01 flat-6 engine that was later nudged to 160-horsepower in the 911S of 1966. The 2.0-liter unit was joined by a 1.6-liter 90-horsepower unit which was a direct evolution of the engine on the 356 and was fitted to the 912. The SOHC 6-cylinder on this car boasts 190-horsepower and is fed by two triple-throat Weber 40 IDS carburetors. The early 911s came with a Type 901 transmission with either four or five forward gears, this car utilizing the 5-speed gearbox. It has independent suspension all around with Macpherson struts up front and a sophisticated semi-trailing arm and torsion bar-sprung rear assembly. This particular car has disc brakes behind the steel Fuchs rims. The car in stock trims weighs around 2,381 pounds, but this one is at least 400 pounds lighter. The prices for early 911s vary a lot. As per usual, condition and originality are equally important, as are the car’s history and equipment. As such, there’s a very broad price range for these cars from as little as $80,000 for a rough one to as much as $260,000 for a rare and impeccable example ready for the Pebble Beach lawn. This car, which was sold through the RM/Sotheby’s auction house during their 2016 Monaco sale, was sold for just $97,107. The unusual paint job definitely played its part as there aren’t many people out there who are looking for a 911 with that kind of livery on it. 3.3-liter dual-overhead camshaft Colombo V-12 engine producing between 260-horsepower. It had three twin-choke Weber 40 DCZ 6 carburetors. The chassis of the 275 was of the ladder frame type, fabricated from oval-section steel tubes. The luxurious grand tourer came with double wishbone independent suspension with Koni shock absorbers and coil springs on all four corners. This was actually a first on a Ferrari production model as, previously, Ferraris were designed with antiquated live rear axles. Dunlop disc brakes came in standard although they were considered undersized. The steel-bodied 275 GTBs weighed 2,866 pounds while the very rare alloy-bodied Competition models tipped the scales at just 2,452 pounds. Nowadays, the 275 GTB is a multi-million-dollar garage queen considered one of Ferrari’s finest designs. It was also a capable racer winning its class at Le Mans in the mid-’60s. The E-Type was the grand tourer that replaced the successful original XK series of models. It had a curvaceous body designed by Malcolm Sayer and was one of the fastest cars of its day, reaching 62 mph in 7 seconds. The body was unified with the frame for the first time. It had independent suspension all around and rack and pinion steering. The early Series 1 E-Types came with the now-legendary 3.8-liter straight-6 which developed 267-horsepower and made the 2,900 pounds GT reach a top speed of 150 mph. A 4.2-liter engine was later available. The original E-Type is considered to be one of the most beautiful cars of all time, an opinion that was apparently shared by Enzo Ferrari. The S1 models are the most expensive of the lot with prices surpassing $100,000 for the pristine examples. You’ll argue that both the Ferrari and the Jaguar are faster sports cars but, when Porsche introduced the 911 as a replacement to the 356, their intention was to go up-market with the new model, so it’s only natural to compare it to some properly fast and properly exotic machinery which boast the finest leather and wood trims inside. The Porsche never reached such levels of luxury, but that’s just a part of the German car’s charm over the British and the Italian stallions. 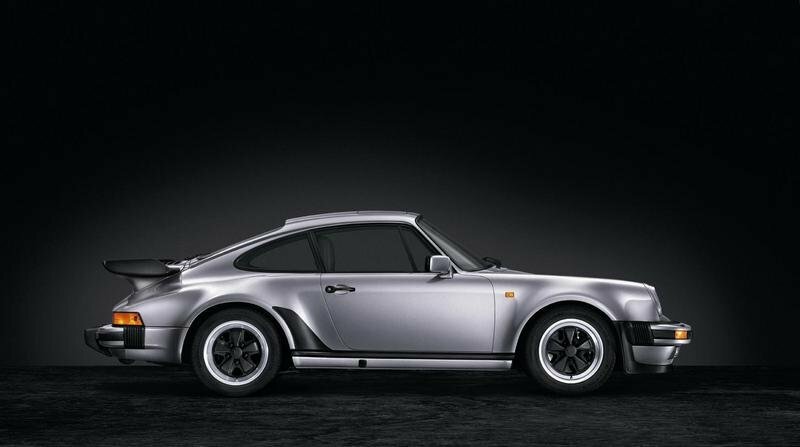 The Porsche 911 in its original unadulterated form is an automotive icon like no other. The Peter Klasen livery that covers the beautiful lines of this short-wheel-base example may not be to everyone’s liking but it surely makes the car to pop out in a crowd. It just needs the right pair of eyes to cherish it for what it is: a competition Porsche that’s ready to race covered in a color scheme that’s wackier than most of BMW’s Art Cars. Granted, it may not be as revered as the Calder 3.0 CSL or the Warhol M1 Gr.4 but, just like those two Bimmers, you won’t see another car painted like this Porsche anywhere. And it’s also one of the few cars that were presented as part of a painter’s exhibition. Read our full review on the 1975 – 1989 Porsche 911 (930). Read our full review on the 1993 – 1998 Porsche 911 (993).